6 So when they had come together, they asked him, "Lord, is this the time when you will restore the kingdom to Israel?" 7 He replied, "It is not for you to know the times or periods that the Father has set by his own authority. 8 But you will receive power when the Holy Spirit has come upon you; and you will be my witnesses in Jerusalem, in all Judea and Samaria, and to the ends of the earth." 9 When he had said this, as they were watching, he was lifted up, and a cloud took him out of their sight. 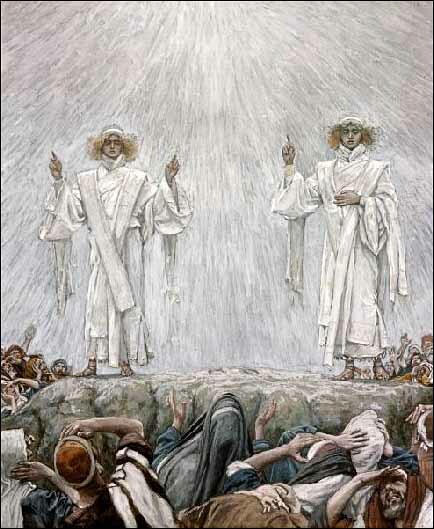 10 While he was going and they were gazing up toward heaven, suddenly two men in white robes stood by them. 11 They said, "Men of Galilee, why do you stand looking up toward heaven? This Jesus, who has been taken up from you into heaven, will come in the same way as you saw him go into heaven."